The rugged case for Kindle fire HDX 7''(2013 model). Protects the kindle device from sand,dust,wind,rain,vibration,drop and other abuse usage. Provides shock absorption and impact resistance. Food class silicone + PC. Silicone cladding can absorb and reduce the vibration. Easily access to all ports,buttons, speakers and the cameras. A case should not be this fun,but it is! 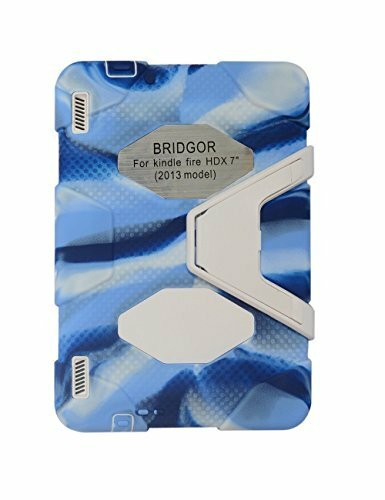 The BRIDGOR Kindle Fire case combines durable protection with a lightweight design. Constructed from a special silicone that provides shock absorption and impacts resistance, the BRIDGOR child-proofs protect your device from the kid in all of us. The BRIDGOR case is the most protective case we've ever built.Tested and certified to meet or exceed US Department of Defense Standard 810F, BRIDGOR Military-Duty Case is designed from the inside out to protect your Kindle fire from extreme conditions, dirt, sand, rain, shock, vibration and a host of other environmental factors.BRIDGOR is built on a shatter-resistant polycarbonate frame clad in rugged, shock absorbing silicone. A built-in screen protector seals your Multi-Touch display from the outside environment, while hinged plugs seal the dock connector, camera lens, headphone port, hold switch and volume controls. The included stand clips on, then folds open for landscape viewing and typing.BRIDGOR is independently tested and verified to meet or exceed environmental testing standards for blown rain, blown dust and grit, vibration, shock, temperature and humidity.Your kindle fire is totally safe when your kids want to carry it along!